This coupon promotion is only valid for future purchases. This promotion is valid only for US domestic shipments and does not apply to transactions initiated, ship to or paid from outside the United States. Coupon is valid only to be applied to client purchases and do not have cash value or cannot be exchange for cash. Minimum purchase requirement of $100 before shipping fees and any taxes must be met. Cannot be combined with any other promotional coupons and is not valid for special pricing negotiated below shopping cart price. Purchases must be made on or before coupon expiration date. 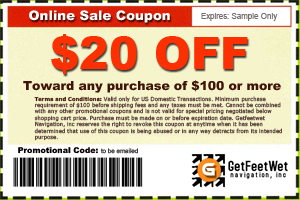 Getfeetwet Navigation, Inc reserves the right to revoke this coupon if at anytime it has been determined that use of the coupon is being abused and detracts from its intended purpose. Customers are automatically enrolled to Getfeetwet's exclusive Private Sale Club and will receive the club's monthly Private Sale Promo email. All information provided as part of this promotion is for exclusive use of Getfeetwet Navigation, Inc use and will not be share or made available to any party other Getfeetwet Navigation, Inc.